A priest and a nun are on their way back home from a trip when their car breaks down. They are unable to get it fixed, so they decide to spend the night in a hotel. The only hotel in the town has only one room available. Priest: Sister, I don't think the Lord would have a problem, under the circumstances, if we spent the night together in this one room. I'll sleep on the lounge and you have the bed. Priest: Okay, I'll get you a blanket. 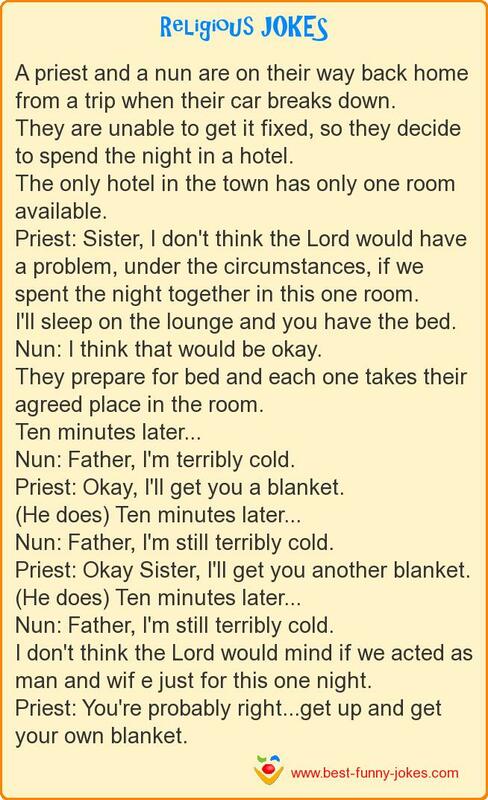 Priest: Okay Sister, I'll get you another blanket. I don't think the Lord would mind if we acted as man and wif e just for this one night.